If you are currently studying your A Level, BTEC or Access course and are interested in studying Mechanical Engineering at university, then we would love to see you at our Taster Day. Mechanical Engineering is one of the most diverse of all engineering disciplines, with employment opportunities available across pretty much every sector you can think of: energy, transport, aerospace, automotive, robotics, pharmaceuticals and the marine industry. Wherever you want to go, a degree in Mechanical Engineering can help you to get there. Mechanical Engineers often find themselves managing people and resources, as well as developing new materials and technologies. 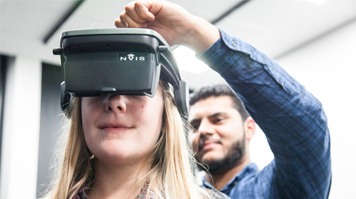 Come to our Mechanical Engineering Taster Day and experience sample lectures, an exciting hands-on experience with hardware and software, and an exclusive tour of our 3D Computer Aided Design Virtual Engineering Lab. Each Taster Day allows students to learn more about their subject of choice through a sample lecture and gain an insight into studying at university through a practical session delivered by LSBU academics. Included in the visit is an overview of entry requirements and other relevant information about the application process.